Sculptor Mel Katz continues his always evolving exploration of shape and contour. Starting with the drawn line, he translates his ideas into sculptural objects that encourage thought about the concepts of two and three dimensional space. 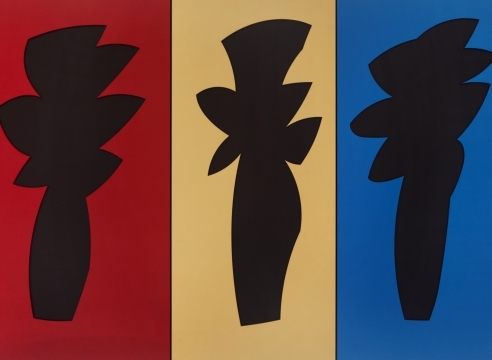 Using bold and contrasting colors, Katz plays with positive and negative shapes. This show features wall sculptures made of machine cut, anodized aluminum. The images that result are simple yet exuberant, made with a clear energy and vision that has been developing for decades. Katz is a 50 year veteran of his craft. His work is fresh, clean, and modern, refined by years of technical expertise and aesthetic consideration. Originally from Brooklyn, New York, Mel Katz graduated from the Cooper Union Art School in 1953. He moved to Portland in 1963 and became well known in the early 1970s as one of the founders of the nationally reputed, Portland Center for the Visual Arts. Katz taught art at Portland State University until retiring in 1998. He has been exhibiting his work since 1956, which includes a retrospective at the Portland Art Museum in 1988 and the highly acclaimed traveling exhibition “Still Working,” in 1994. Selected collections include; the Portland Art Museum, OR; Seattle Art Museum, WA; Tacoma Art Museum, WA; City of Seattle; Oregon Health Sciences University, Portland; Good Samaritan Hospital, Portland, OR; and Safeco Insurance, Seattle, WA. He is currently working on a commission for Fire Station #38 in Seattle.